Just wanted to let you know that is dunk-able, sweet and spicy healthy ginger snap recipe is sponsored by my friends over at Amoretti! 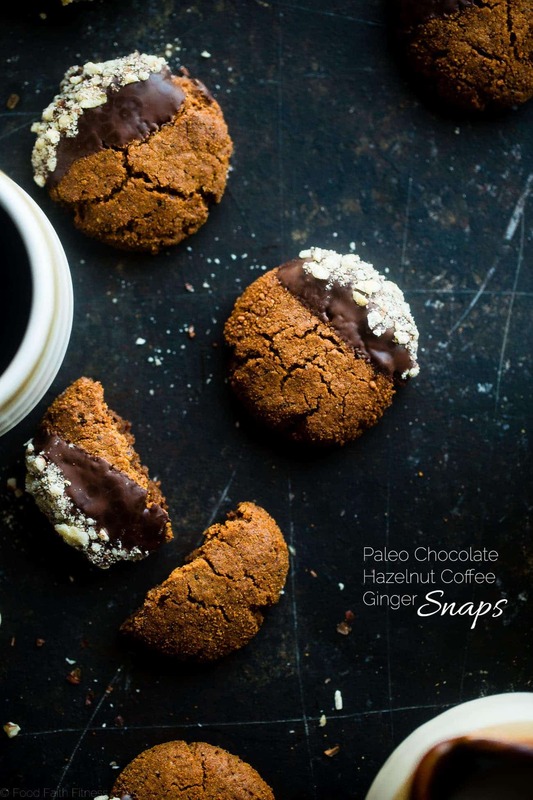 This easy, sweet and spicy paleo healthy ginger cookies has notes of rich coffee! They’re the perfect healthy, gluten free cookie for the Holidays! Usually, I try to not yell at you in excitement on Monday mornings. I know you’re bleary eyed, hating the world because why-are-Mondays-even-a-thing? AND the only thing keeping you going is the fact that you get to eat cookie dough overnight oats for breakfast. 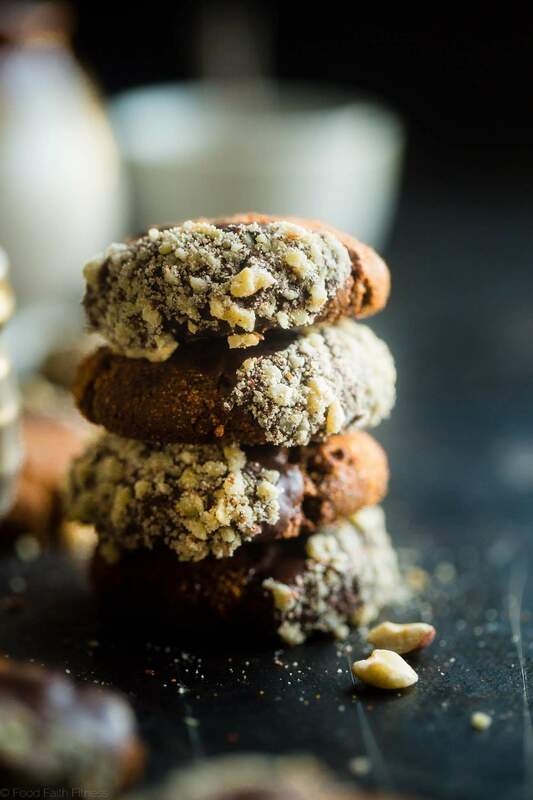 BUT COFFEE CHOCOLATE HAZELNUT GINGER SNAPS. You GUYS. The only way to do justice to such insane amount of snappy, sweet and spicy ULTIMATE cookie perfection is with CAPS LOCK in F-U-L-L force. Plusplusplus!!! There’s coffee in these cookies. Which means, like last monthly pumpkin spice latte vegan crepe cake, these crunchy bites of Holiday-flavored deliciousness are pretttyyyyy much BEGGING YOU to be eaten in the wee hours of the morning when your brain isn’t quite connected with the whole “gotta adult and live a real-person-working life” thoughts that will eventually swirl around in your morning brain. *Insert musical notes emoji* the best part of waking up is coffee in your…COOKIE. Better yet? Dunk coffee flavored, crunchy cookies INTO your morning coffee. Coffee times 2? #Winning. If you’re not a coffee drinker, you could also dunk ’em in a Ginger Snap Cookie Steamer Drink. Cause ginger snap to the power of 2 is ALSO a big ol’ WIN. Last month, I introduced you to Amoretti, and their nut flours, with their HOLY-YUM pecan flour. <– Did you know that was even a thing? I did not. BUT, IT IS. And it’s, liiiiike SUPER, SUPER TASTY and makes ah-MAY-zing pecan pie paleo cookies. THIS MONTH, we’re keepin’ up with the holiday cookie theme and giving the classic Christmas treat a run for its money. 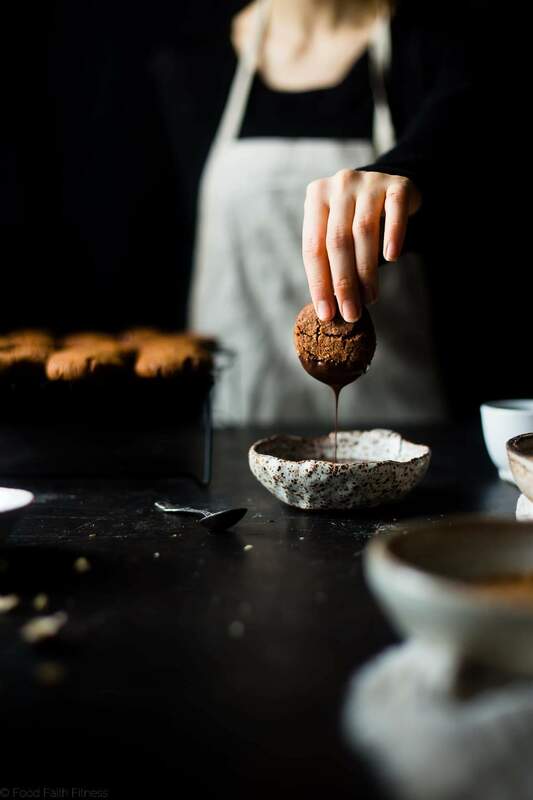 In the sense that we’re making this ginger snaps recipe M-O-R-E full of tasty, yummy, COZY feelings AND NUTRITION. I know nothing about how that happened though. I assume my 5 lb dog somehow got a ladder, climbed into my freezer and ate them all. Isn’t that what dogs are for? Blaming them when you don’t want to own up to what you’ve done? EITHER WAY. 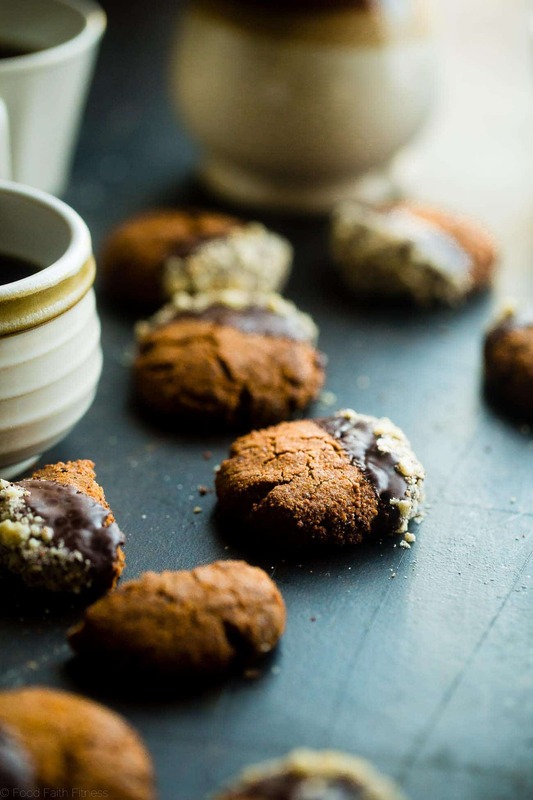 IF we’re doing Christmas math, these are epic to the power of 100 because we’re using Amoretti’s crazy-addicting, purely delicious Hazelnut Flour, mixing it with COFFEE (<3 <3 <3) and then dunking that combination of food nirvana into CHOCOLATE. Side note. Amoretti does also make a variety of Hazelnut Chocolate spreads. Soooooo, yes. You should try those too. More Christmas math comin’ at ya: chocolate + hazelnut = everything you could ever dream about. Divide that by COFFEE? Crunchy, cozy, healthy ginger snap recipe BLISS. In other news: can we just talk about the SNAP. Did you HEAR it in the video? If you’re looking for a snappy homemade ginger snaps, then you’re gonna get super excited about these. It’s not one of those lackluster snaps that kind of leaves your inner ginger-snap-aficionado MEGA disappointed. This snap is going to give you warm and fuzzies allll the way from your taste buds to your tippie toes. Spicy cinnamon, warm ginger, toasty hazelnuts, sweet chocolate AND energy bumpin’ coffee. 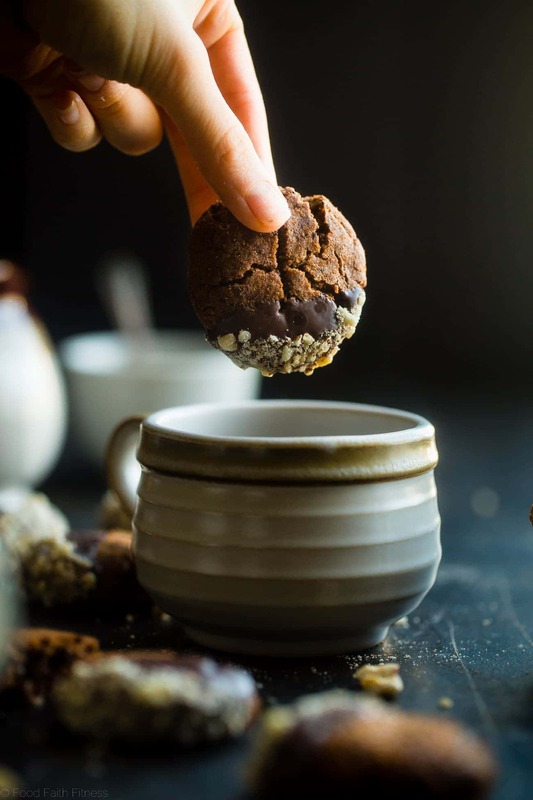 The cozy Christmas cookie vibes are definitely in the air with this healthy ginger snap recipe. 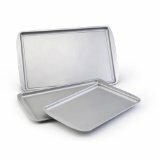 Preheat your oven to 350 degrees and line 2 baking sheets with parchment paper or a silpat. 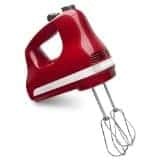 In a large bowl, using an electric hand mixer, beat together 1 cup of the coconut sugar (reserving the rest for later,) the coconut oil, molasses and egg white until well combined. Add in the hazelnut flour, coconut flour, baking soda, coffee, ginger, cinnamon and salt and stir until well mixed. Spread the remaining 2 Tbsp of coconut sugar into a shallow plate. Roll the dough into 1 Tbsp balls, then roll around in the coconut sugar. Bake the until the cookies are just lightly brown on the edges, about 17 minutes. Remove from the oven, and let them cool on the pan for 5 minutes. Then transfer them to a cookie sheet to cool completely. Note that your cookies will feel really soft just out of the oven, but they firm up a lot once cooled! Let the chocolate harden and DEVOUR! *Please weigh your flours to ensure perfect results! 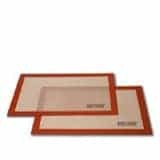 **If you can't fit both sheets in the oven at once, leave the second one out at room temperature. *** You can toast hazelnuts in a 350 degree oven for 8-10 minutes. Right! I am alllll about a little extra coffee kick! Thanks! These look pretty darn amazing. Love the chocolate dip to add that extra bit of flavor. Thank you! A little extra chocolate is always good! Gingersnaps are my jam! These looks insane Taylor! So much to love about these cookies! 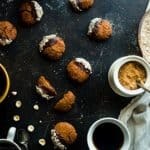 Love gingersnaps, hazelnut, and chocolate and would love a dozen or two of these on my holiday cookie spread! Thank you! Ginger snaps are so good right?! I love cookies like this! So many flavors!!! Molasses + coffee + ginger + chocolate = fanfreakintastic! YESSSSSSSSSS the best way ever to get your daily cup!!! You sold me at coffee in the cookie!!! I love a twist on a classic and this looks amazing! Coffee makes everything better! Thanks! These look AMAZING! Seriously I need to include these on my cookie trays this year! I love all of your healthier cookie recipes! thank you! I kind of got distracted by your STUNNING photography and then was snapped out of my trance when I saw how healthy these ginger snaps were. And they involve a lot of my favorite foods … coffee, hazelnuts and chocolate! Lovely recipe. I shall be back for more. Love your site! My favorite foods too – we MUST be cookie soul sisters Alexa! And thank you SO much for the love – I am pumped to have you and hope you find some recipes you love! 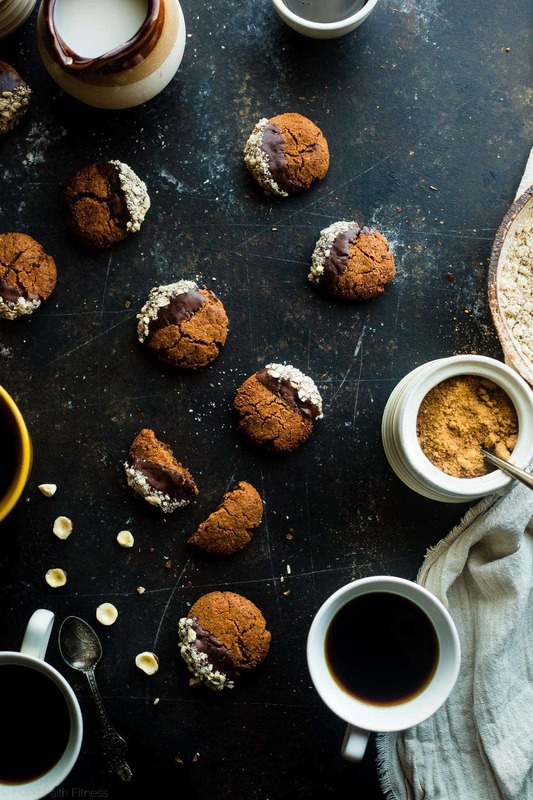 These photos make me wanna cozy up with a fire, coffee, and some of these gingersnaps! I did my job! 😉 Thanks! I hope you love them Natalie! Thanks for saving! These are sooooo my kind of cookie!!! Gosh, these look incredible Taylor! That snap! And I absolutely love your photography! the chocolate dip pushes these over the edge into amazing!! I just love seeing your process in the kitchen. It terrifies me a bit, but you make it look so beautiful and fun… you’re like a hallmark movie for food! I love hazelnuts so much that my husband nicknamed me “Hazel” shorting after meeting. 🙂 These are so my kind of cookie! And I love coffee in chocolatey things- it really deepens the flavor. So so good! And, you’re right, totaaaalllly does! Thanks Jenn! YES! You had me at coffee! All great flavors in one cookie. How could you good wrong?! How lovely. Coffee infused desserts are my idea of an extra special treat! My favorite cookie, dipped in my favorite coating. These need to get made! 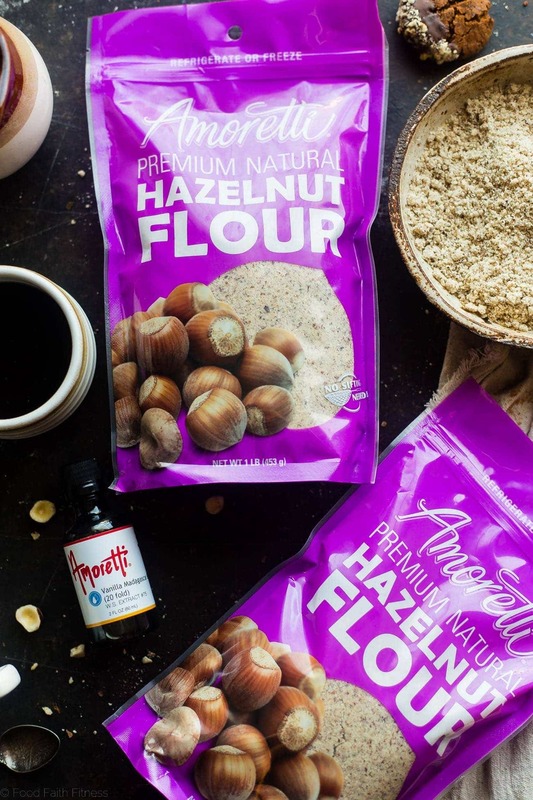 Oh my GOSH, I haven’t used hazelnut flour… I may have to get my hands on some because of this recipe… yum! YOU HAVE TO! It’s amaze!! Coffee in the cookies? I don’t know if I have ever seen such a delicious looking ginger snap before! Two of my favorite baking flavors – ginger and hazelnut – all in one cookie. In heaven! And your photos are gorgeous, as usual. 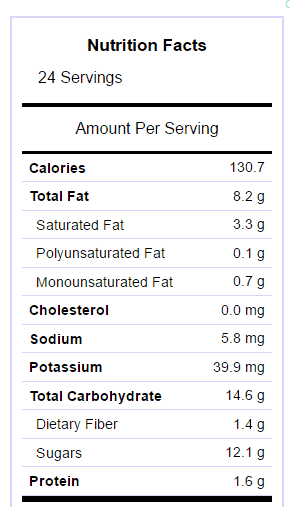 Yep, 1 cookie is 1 serving! Hazelnut flour seems so intimidating! But given that hazelnuts have been on my radar lately, I would definitely give it a shot! You would love it girl!